When a car pulls up next to you at a traffic light, and the driver has their in-car sound system blaring (full-blast, with the bass turned way up), your own car window might buzz or rattle. What you are experiencing when this happens are sympathetic vibrations. Even though the sound is not coming from your car, your window vibrates in sympathy with the sound coming from the neighboring car. Similarly, when you sing, there will be different areas in your body which vibrate in sympathy with the sound coming from your vocal folds. Singers feel all kinds of different sympathetic vibrations in their bodies when they sing. 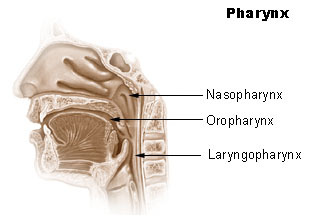 One place sympathetic vibrations can be extremely proncounced is the area behind the nose, called the nasopharynx. This little pocket at the top of your pharynx can often really buzz and vibrate when you are singing very well. Whenever a singer tries to force the voice into having resonance in the nasopharynx there is an increased chance that they will produce a sound that has an unflattering nasal quality to it. If you are feeling resonance behind your nose, yet the tone does not alter when you pinch your nose closed, there is a good chance that you are not singing with nasality in your tone, but are still allowing sympathetic resonance in the nasopharynx to occur. This is ideal. The best way to avoid nasality from happening in the first place, is to refrain from “placing” your tone anywhere, including the so-called “mask.” Instead, just allow the resonance to ring in a natural and unforced manner where it will. When your voice is balanced, the sympathetic resonance will take care of itself. It’s something that you will simply notice is happening. Attempting to control sympathetic vibrations almost always leads to trouble. If you have a tendency to sing with a nasal sound, or people have told you that you “sing through your nose,” there are some fast and powerful techniques that a good voice teacher can use to help you completely rebalance your voice. As a result, rather than having a nasal quality, it will have a powerful, rich ringing sound that fills up the entire room and is extremely pleasing to listen to. Singing with a balanced voice allows you to focus on what you are singing, rather than trying to figure out where to place your voice. When you sing with balance, you enjoy singing so much more, and your audience loves to listen to you!